So now this week, we return to reviewing some extras from Burning Shadows, and we start with the original Kanto Raichu non-GX. Raichu here is pretty useful, seeing as his Ability is an on-evolution Paralysis. Yes, evolving a Pikachu into this Raichu triggers Evoshock, which Paralyzes the opponent’s Active Pokemon. This can prevent your opponent from attacking with that Pokemon unless they use up resources to switch it out with something else – as always, a very useful maneuver. In the meantime, you can attack with your Raichu if you wanted to, using his Volt Tackle attack. At 3-for-130, it’s a pretty solid option for 2HKO-ing most anything, though it does deal 30 damage to Raichu himself. If you time your Evoshock right, though, you can stop your opponent from attacking you on your next turn and get in those 2 Volt Tackles needed to KO stuff, though you end up with only 50 HP left. Still, it’s a solid combination if you wanted to use just Raichu. There are a few better options though to use, but I’d expect Electric decks to consider running a 1-1 tech Raichu for that Paralysis. After all, one good stun can win the game! …but Guzma could make that hard. Next Time: Out of the shadows once more…cause they’re burning…the shadows are on fire? Raichu (Burning Shadows, 41/147) shocked me when I first saw it in evaluating the Burning Shadows expansion set. 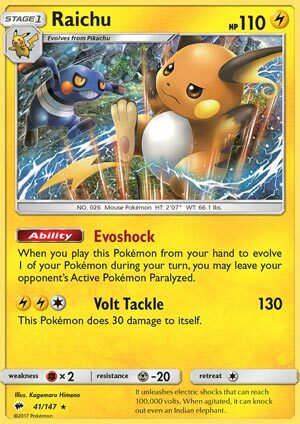 Evoshock, Raichu’s ability, allows you to paralyze your opponent when you play this card from your hand to evolve it. This seemed like an unbelievable play – guaranteed paralysis and it’s not even the effect of an attack! However, I quickly surmised – like we all did – that in this Guzma (Burning Shadows, 115/147) heavy format, paralyzing an opponent’s active Pokemon just wasn’t going to be as effective as it would have been, say, in last year’s meta. It just seemed like there were so many ways to get around that paralysis, so I never really tried it… until now. Evoshock was great in a couple of matches. I teched in Devolution Spray (Fates Collide, 95/124), Super Scoop Up (Burning Shadows, 127/147), and even Rescue Stretcher (Guardians Rising, 130/145) and was able to string together multiple turns where I was able to paralyze my opponent. It worked really well and had to be very frustrating for my opponent. The first deck I tried it in was a spread deck with Tapu Koko (SM31) and Meowstic (RC15), and I went 2 W 3 L with that deck. Then I tried it with Tapu Koko GX (Guardians Rising, 135/145), but I went 0 W 3 L. In two out of the three matches – and in eight of my last ten GX featured attacker games – I have come up against Hoopa (Shining Legends, 55/73) or Alolan Ninetales (Guardians Rising, 28/147). It took me too long to get Raichu powered up, it was too difficult to shift from big daddy Koko to Evoshock Raichu as the main attacker. It reinforces, at least to me, that Hoopa and Alolan Ninetales are becoming meta defining cards – they’re certainly causing me to play decks that don’t feature GX attackers. I played Greninja (Breakpoint, 40/122) all weekend and won plenty with it… and hardly saw Hoopa or baby Ninetales at all. Evoshock Raichu, when you can get it going, works very well. It can completely prevent your opponent from attacking for multiple turns, sometimes consecutively. This gives you a tremendous advantage. Unfortunately, there are too many outs to this paralysis, from evolving, to Guzma, to switching cards, and even other Trainer cards that remove special conditions, paralysis just isn’t consistently effective. If you come up against a deck that doesn’t have a lot of the outs, that relies on Float Stone (Breakthrough, 137/162) to get an incapacitated active Pokemon back on the bench, then it can potentially work well for you. Overall, however, against most decks it will fall short of what you need it to be for you to have success. Imported from Pokémon TCG Amino; Originally posted May 20, 2017; last edited June 17, 2017. Hello readers! Vince here, and I’m reviewing a new Raichu card today. This card is on SM3, meaning it could be in the burning shadows set late this year. Upon looking at it, I think this card is begging to be abused! Raichu is a Lightning type, which can exploit weakness found on some water types and Colorless types. There’s not much support that I can think of, but Magnezone fuels Lightning energy while Eelectrik recovers Lightning energy; Flash energy removes the weakness from lightning Pokémon. 110 HP is pretty high for a regular Raichu card barring other game mechanics. Being weak to fighting is dangerous since they specialize buffs to reach high damage outputs for one energy. Resisting metal is useful if there’s a solid metal type attacker, but even with 110 HP isn’t enough to tank some major attacks. Retreat of one is alright, though I prefer if it had free retreat. Raichu has an ability and an attack. Evo Shock is a coming-into-play ability that paralyzes your opponent’s active if you evolve Pikachu. Paralysis is the best status condition to inflict because your opponent’s active cannot attack or retreat (has to resort to “switching” related cards like Switch or Ultra Road). Volt Tackle does 130 for LLC and has a clause that self inflicts 30 damage to itself. This is good amount of damage as well as a magic number now to 2HKO Pokémon (or OHKO if they’re weak to Lighting), but I wouldn’t want to give the opponent an easier time for them to KO Raichu, since one use of Volt Tackle brings the HP down from 110 to 80. So how do we use Raichu? Auto-Paralysis can be downright unfair in most cases, but it probably won’t help if the opponent’s active is going to be KOed anyway. Even though Evo Bolt is a one time use, it can be reused by having cards that put the Pokémon back to your hand, so something like Super Scoop Up (coming back to standard soon), Devolution Spray, AZ (Expanded option), and Scoop Up Cyclone (Expanded only option) will allow Raichu back to your hand, ready to evolve from a different Pikachu. Raichu combos very well with Darkrai-GX, since it’s GX attack Dead End automatically KOs the opponent’s active if it has a special condition. So already this card is good on my book. What about other Raichu options? There’s one from XY that has circle circuit that does 20 for each benched Pokémon that you have, so it could range between 0 to 160. Another Raichu from XY Breakthrough had Thunderclap Shot that does 50 for each Pokémon-EX, pretty good but once all the EXs rotate out, then this card is underwhelming. And finally, there Raichu Break which get 130 HP and a attack called Grand Bolt which does 170 for LCC with a forced all energy discard; Not something that can be repeatedly used unless we go through Expanded options. This new Raichu doesn’t have to compete with other Raichus, but having those options does give you an idea on how you run this card. Paralysis can be played around with Solgaleo-GX, Zoroark, Virizion-EX, Slurpuff, Comfey, and Keldeo-EX plus some switching cards. Not all decks have those Pokémon mentioned above, so a Raichu user can catch players off-guard! Overall a good card in Standard and Expanded. Unfortunately it is hard to use Raichu in Limited, since the self damage would eventually make the Pokemon fall apart before you start to take prizes. Note: Raichu has an potent ability that can be abused to great effect, creating a soft lock. It also helps Darkrai-GX land a one time strategic KO.